Since his rather leaden delivery of an indifferent speech at the Tory party conference fringe, there seems to be something of a consensus that we've experienced "peak Johnson". Fortunately, the oaf's influence is on the wane. That still doesn't stop his newspaper employer publishing his overpriced drivel in its pages, with the latest edition repeating well-worn myths about regulation and Brexit. According to the oaf, "it makes sense that UK companies exporting to the EU will have to comply with EU standards". But why, he asks, "when only six percent of UK companies export to the rest of the EU, should 100 percent of UK companies have to obey EU law – within the UK market?" 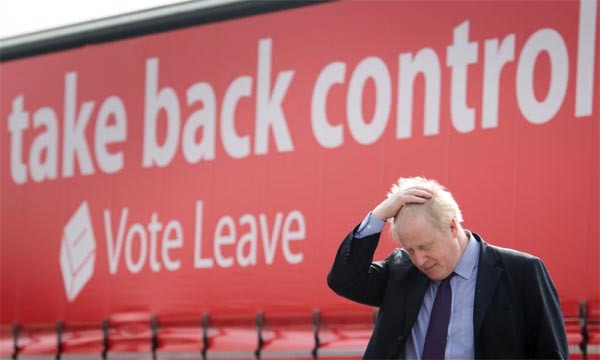 Johnson then asks rhetorically, "how is that consistent with Brexit?". In his (limited) view, this means we are not taking back control. We are losing control, he claims. Would that he knew it (or even cared), his rhetoric has been answered many times, but it is a feature of what passes for the Brexit debate that no argument is ever put to bed. The same old tired memes are trotted out endlessly, without variation or concessions to countervailing arguments. If we had a functioning media, of course, deal with such issues as the utility of regulation and the role of regulatory harmonisation in our future relations with the European Union. But we've been there before. We don't have a reliable media and there is no sign on the horizon of any improvement. Nothing is going to change. The point at issue, though, is that there is nothing more central to the Brexit debate than this issue. Dry, technical and complex it might be, but this is what is driving idiots such as Johnson and his fellow travellers. But it is also what will have to be addressed if the EU is to settle an exit agreement. Basically, the European Union is nothing if not the sum of its acquis, the collection of its rules and regulations which define, amongst other things, the Single Market that has come to be one of its most important accomplishments. And now, the upstart leaver, the United Kingdom, is calling into question that achievement. Even more, the UK (and certainly the likes of Mr Johnson) is suggesting that something which the EU holds so dear really doesn't matter and can be ignored. Surprisingly enough, this isn't playing too well in Brussels. The very essence of its Single Market is the concept of the level playing field – a term which in fact seems to have been coined by UK commentators. If there is to be common regulation to ease the passage of cross-border trade, then there cannot be a situation where those who are exporting to other states have to compete on their domestic markets where there are different, more relaxed regulations which apply only to domestic producers. Such a situation inevitably creates a barrier to international trade, going against everything that the EU stands for. Furthermore, while there is every good reason for seeking to improve regulation and to make sure that it is fit for purpose, we need to move away from the juvenile supposition, harboured by the likes of Johnson, that regulation is necessarily a bad thing, to be avoided wherever possible. We saw something of his puerile approach to the issue during the referendum campaign, with his embarrassing dribble over bananas. Then, he complained wrongly that "you cannot sell bananas in bunches of more than two or three bananas", something that wasn't even true, then using this and some of the other marketing standards pertaining to the sale of this fruit to support his claim that we needed to "take back control" over our law-making. Never mind that marketing standards long pre-date the European Union and, when first conceived, were designed to promote international trade, and to protect growers from unscrupulous buyers. The point of having internationally recognised standards was that buyers knew what they were getting without having to see the produce, while the growers, as long as they conformed with the standards, had a legal right to be paid. A distant buyer could not change the specification mid-stream and reject consignments on the grounds that these new standards were not met. In this context, we see a whole raft of regulation acting not as a drag, but as the facilitator of trade. Both buyers and sellers know where they stand, and the certainty gives them the confidence to undertake what might otherwise be an unacceptably risky process. The other essential point which is ignored by the Johnson tendency is that so much of the technical standard-setting which regulates international trade is increasingly generated by international bodies, acting either at a global or regional (continental) level. From this, two core facts emerge. Firstly, the EU is no longer the primary rule-maker that its has been, and has become much more of a rule-taker, in some cases actively delegating standards formulation to organisations such as UNECE, Codex, and even the OECD. Secondly, since the UK is a subscriber to these organisations, mostly it would be bound by the same rules whether it was in the EU or not – my "double coffin-lid" concept. Leaving the EU does not allow us to take back control over much of our law making. It has already been delegated to a level much higher than the EU. But the real point here is that we're looking in the wrong direction, or expecting the wrong things. As regards much of our technical legislation, it is a matter of supreme indifference as to who or what organisation drafts the standards – they would be much the same, whatever their source. For instance, the technical standards for the sugar composition of jam is determined by the functional requirements of producing a preserved food and the need to suppress mould and fungal growth. Mother Nature is the arbiter, and the regulators simply put into effect the parameters which she dictates. Crucially, for the main part, the majority of people are not the slightest bit interested in the formulation of these standards. They are most often uncontentious, necessary and routine. No one sensible thinks that democracy is in any way threatened. Occasionally, though, rules do pinch. But this can be dealt with by building opt-outs into the system, or by using such devices as the waivers – favoured by the WTO – or safeguard measures, which are a routine part of treaty law (although notably absent from much of the EU acquis). There is no need whatsoever for the supranational construct that is the EU, simply to build a body of trading law. The Efta/EEA concept is not supranational and, in theory, any new law can be rejected by any Efta state. The balance of convenience, though, is such that it rarely happens. This, of course, opens the way for a wider application of the Single Market, taking it away from its political roots, where it was used as a device for furthering political integration. One of the fundamental mistakes of the EU's founding fathers was to confuse the issues, rightly inviting mistrust as to the motivation for new laws. Here, splitting standard-making and the administration of the Single Market from the political objectives of the EU should be a long-term objective of the countries of Europe. Trade is far too important to serve as a handmaiden to the ambitions of those seeking political integration, and the good faith of the EU can never be trusted after it has abused the process for so long. This is why, of course, the UK could easily live with the idea of re-joining Efta and staying in the EEA, pro temp. The direction of travel has, for many years, been towards global bodies taking control of the legislative agenda, and Efta states have considerable influence on those bodies, independent of the EU, where they can set their own agendas. Yet, all the current Efta/EEA states have their reservations about the EEA, and long-term reform is always a possibility. The EU would do itself a favour by divesting itself of the minutiae of trade administration (as it is already doing) – in order to concentrate on high-level politics such as security, defence and foreign affairs. Thus, we are currently being dragged down by yesterday's agendas, despite the issues of law-making having been transformed over the decades to take on a wholly different aspect to that which we were confronting in the nineties. The world has moved on, globalisation is a dominant force and we need new thinking to deal with it. In this, the EU as much as the likes of Johnson, are stuck in the past. The EEA, as it stands, is the child of the nineties – crafted by Jacques Delors – on the basis of a structure from which he subsequently resiled. It is thus not only the UK but the EU which needs to move with the times. But whatever does happen, we are going to make very little progress by rehashing the same old mantras, sticking to nostrums of the past that never actually worked, and sneeringly dismissing attempts to craft new paradigms for the future. What is killing Brexit more than anything is the lack of creative thinking, and the reluctance to step outside the narrow confines of the familiar arguments and deal with the world as it exists in the 21st Century. Left this way, we will die of boredom before anything is settled.